Customers want choices. They want their products in stock and orders shipped fast, leaving logistics and DC operators scrambling to handle more SKUs with quicker than ever turnarounds. Not easy! Add the high cost of labor and space and they need some easy, affordable strategies to move more products quickly and accurately. Here you go…. 4 Tips for Fast, Accurate Carton Flow Order Picking. This is the first step. 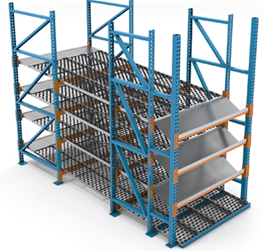 Move the slower case and each picks out of the pallet rack, floor stack and shelving and into carton flow bays or pick modules. You’ll condense order picking in a smaller footprint, increase pick locations – by as much as 40 slots per bay, and boost productivity by reducing labor travel time for order selectors. 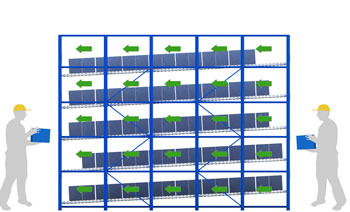 There’s no question, picking cases from carton flow vs. selective rack saves time and space, but standard case flow with flush shelf facings can have some limitations, especially for each-pick applications. Consider adding a tilt-tray for these item locations. Cartons flow from load end as in a typical system, with the first carton pushed gently onto a tilted tray located at the discharge side. Cartons placed in the tilted position adds better visibility and accessibility. 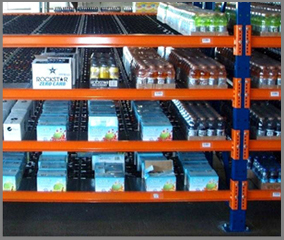 Conventional carton flow relies on individual wheeled tracks installed on shelf or rack frames for specific carton sizes. These systems are simple and cost-effective but also labor intensive for product mix changes – tracks must be lifted and re-installed for new carton shapes and sizes. Mallard’s Dyna-Flo is a flexible, time-saving alternative – full-width wheel bed accommodates multiple carton sizes on each shelf level for easy product slotting and re-slotting. Full lane or entry dividers aren’t necessary for proper flow but can create better lane visibility for case replenishment and picking activities. Entry Guides – bright durable guides snap into place anywhere on the shelf bed and can quickly be moved for new lane configurations. 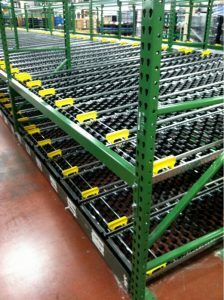 Need Product Slotting Help? No problem. Using your inventory and SKU velocity reports, Mallard’s carton flow specialists will help you design the optimal product configuration for maximum picking efficiency. Call or submit our Contact Us form.